SUMMER themed YinYang yoga classes divided into FIVE individual sessions that can be joined separately or come for the entire ride. Seasonal yoga relies on the wisdom of 5 element theory, where each season is governed by and carries an energy of an element. Summer's special gift - the energy of FIRE - allows us to give and receive warmth. By giving and sharing, we build our own Fire, open our own hearts and bring more light to the world. During summer, the season of maximum expansion, we can become aware of ourselves at our fullest. According to Chinese traditional medicine, the Fire element manifests in our body through the HEART, small intestine, pericardium, and the function known as the triple heater,which regulates internal body temperature. YOUR YOGA will tend to the meridian lines corresponding to the "summer organs", special heart opening sequences in a Yin way. As summer is expansive, it is about being active and about movement, then I will be combining Yin yoga with some Yang fluidity - Qi Gong, gentle yoga, saluting the sun, breath of Joy and having FUN. How is your Fire? Is there joy and laughter in your life? Know that in summer the energy of Fire supports you in enriching your enjoyment of life, your relationships, getting closer, opening outward, being receptive to others. 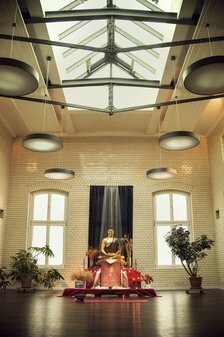 We will start May 31st and then continue until end of June every WEDNESDAY at 8 pm at Buddhistisches Tor Berlin at Grimmstrasse 11C, Kreuzberg.